Sometimes, a fighter knows when to call it quits. Oftentimes, Father Time needs to intervene and drag them out of the cage kicking and screaming. Other times, UFC president Dana White has to point them towards the retirement home. 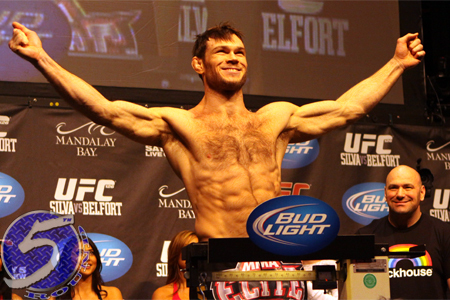 That latter is the case for former champions Forrest Griffin (Pictured) and Matt Hughes. Following Thursday’s press conference, White revealed he’s pushing the Octagon icons to hang up their mixed martial arts mitts. Hughes was the welterweight division’s Georges St-Pierre before St-Pierre became GSP. However, the 38-year-old is coming off back-to-back knockout losses. Griffin, on the other hand, posted a unanimous decision over Tito Ortiz last month and has won three of his last four. Nonetheless, White believes it’s time. “There’s nothing left for Forrest to prove, either,” White added. “He won ‘The Ultimate Fighter,’ he’s had an amazing career, he won the title when everyone thought he couldn’t, he became a huge star, he made [expletive] loads of money, he’s got a beautiful wife, he’s got a baby. At the end of the day, White will likely allow the fighters to call their own shot because he understands it’s difficult to cue up the swan song.